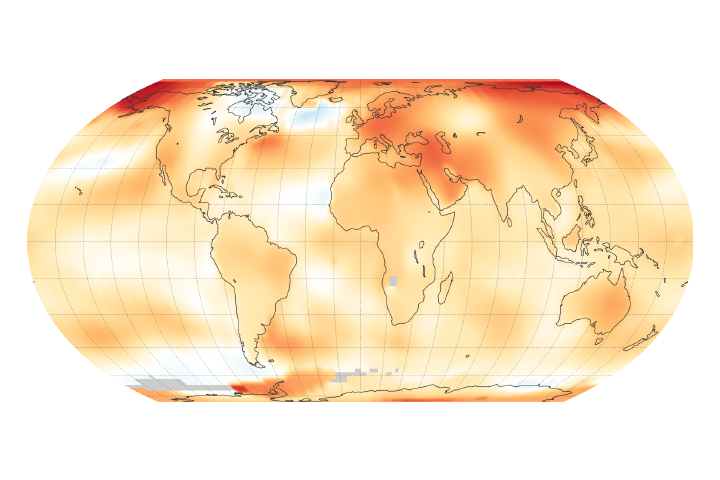 The world is getting warmer. Whether the cause is human activity or natural variability, thermometer readings all around the world have risen steadily since the beginning of the Industrial Revolution. According to an ongoing temperature analysis conducted by scientists at NASA’s Goddard Institute for Space Studies (GISS), the average global temperature on Earth has increased by about 0.8°Celsius (1.4°Fahrenheit) since 1880. Two-thirds of the warming has occurred since 1975, at a rate of roughly 0.15-0.20°C per decade. The maps above show temperature anomalies, or changes, for 2000-2009 (top) and 1970-1979. The maps do not depict absolute temperature, but how much warmer or colder a region is compared to the norm for that same region from 1951-1980. That period was chosen largely because the U.S. National Weather Service uses a three-decade period to define “normal” or average temperature. 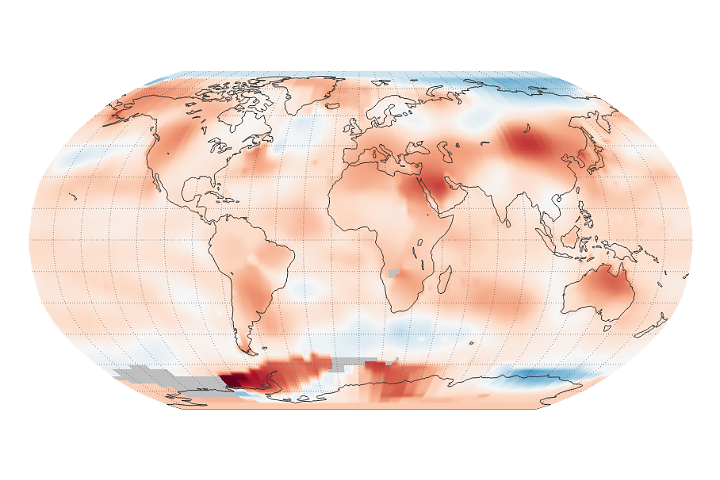 The GISS temperature analysis effort began around 1980, so the most recent 30 years were 1951-1980. It is also a period when many of today’s adults grew up, so it is a common reference that many people can remember. 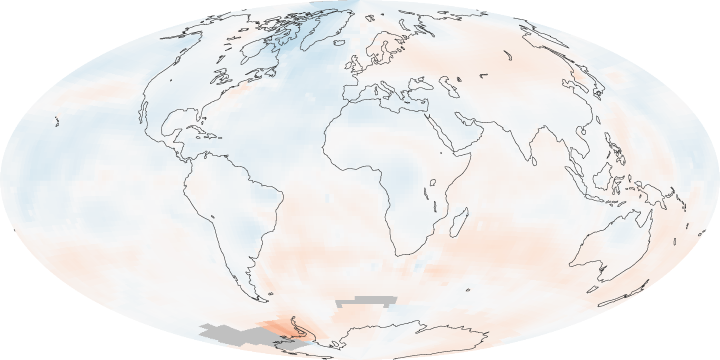 To conduct its analysis, GISS uses publicly available data from 6,300 meteorological stations around the world; ship-based and satellite observations of sea surface temperature; and Antarctic research station measurements. 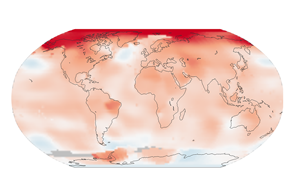 These three data sets are loaded into a computer analysis program—available for public download from the GISS web site—that calculates trends in temperature anomalies relative to the average temperature for the same month during 1951-1980. 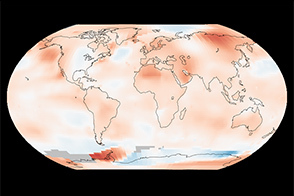 The objective, according to GISS scientists, is to provide an estimate of temperature change that can be compared with predictions of global climate change in response to atmospheric carbon dioxide, aerosols, and changes in solar activity. The temperatures we experience locally and in short periods can fluctuate significantly due to predictable cyclical events (night and day, summer and winter) and hard-to-predict wind and precipitation patterns. But the global temperature mainly depends on how much energy the planet receives from the Sun and how much it radiates back into space—quantities that change very little. The amount of energy emitted by the Earth depends significantly on the chemical composition of the atmosphere, particularly the amount of heat-trapping greenhouse gases. Read more in World of Change: Global Temperatures. NASA images by Robert Simmon, based on data from the Goddard Institute for Space Studies. Caption by Michael Carlowicz. The world is getting warmer, whatever the cause. According to an analysis by NASA scientists, the average global temperature has increased by about 0.8Â°Celsius (1.4Â°Fahrenheit) since 1880. Two-thirds of the warming has occurred since 1975. Hansen, J., R. Ruedy, M. Sato, and K. Lo (2010). Global surface temperature change. Reviews of Geophysics, doi:10.1029/2010RG000345, in press. National Academy of Sciences (2006, July 27). Testimony to U.S. House of Representatives -- Climate Change: Evidence and Future Projections. Accessed November 30, 2010. NASA (2010, January 21). 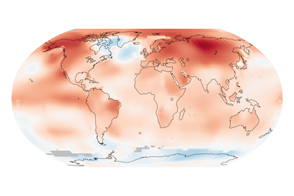 2009: Second Warmest Year on Record; End of Warmest Decade. Accessed November 30, 2010. NASA Goddard Institute for Space Studies (n.d.). GISS Surface Temperature Analysis. Accessed November 30, 2010. NOAA Paleoclimatology. (n.d.) Climate Timeline Tool: Climate Resources for 1000 Years. Accessed December 1, 2010. 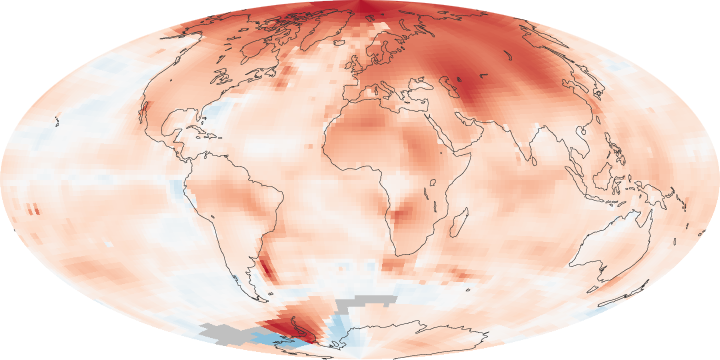 NOAA Satellite and Information Service (2010, July) State of the Climate in 2009. Accessed December 1, 2010.